Fry bacon until crisp. Remove bacon and drain grease/drippings into bowl, reserve. Wash and prepare vegetables. Place vegetables in large dutch oven and just cover with water. Cook over medium heat, covered, until vegetables are tender. Prepare white sauce with reserved drippings mixing well. Slowly add to vegetables (do not drain) stirring to mix. Heat through and add bacon pieces. Add 1 tablespoon of parsley flakes if desired. Quarter potatoes with the skin on and place in a medium sized mixing bowl. Add olive oil, salt, pepper, garlic and rosemary and toss in bowl until evenly coated. 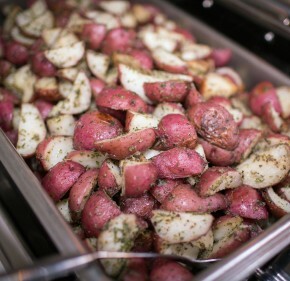 Transfer seasoned potatoes to a nonstick baking dish or a baking sheet covered with aluminum foil. Place in oven for about 30-35 minutes or until golden brown and tender… then ENJOY! 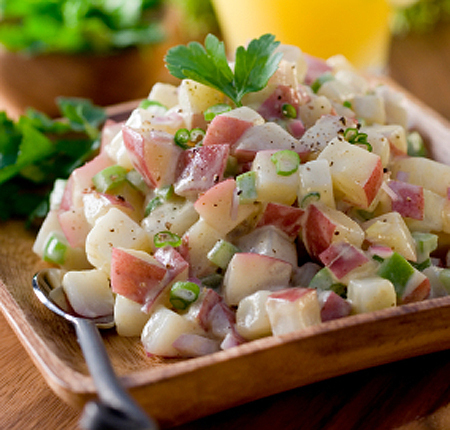 Try this red potato salad recipe with fresh McCain potatoes for a delicious side salad year round. Cooking time: 20-25 minutes Makes approx. 6-7 cups (eight 3/4 cup servings). Boil eggs for 10 minutes and set aside. Wash potatoes. Boil whole, unpeeled, for approx. 20-25 minutes or until very soft. Drain. Spread out on a baking sheet and pierce with a fork to help let the steam out. Let cook for 5 minutes. Leaving the skins on, chop the potatoes coarsely and place in a large bowl. Add cooked eggs, celery, red pepper, red onion, and the pickles. Toss. Add yogurt, mayo and vinegar, Stir till well mixed, Chill. Keeps well in the fridge for up to 2 days. If the salad is dry, add an extra 1 tbsp. (15 ml) mayo + 2 tbsp. (30ml) plain low-fat yogurt. A great way to enjoy McCain Potatoes from the BBQ! 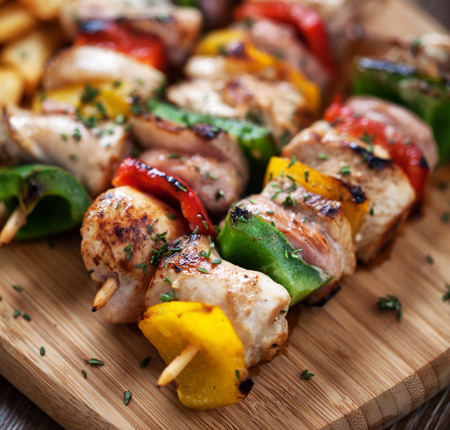 Toss the kebabs in your favourite vinaigrette after removing them from the grill; serve immediately. For the dips, combine all ingredients and season to taste with salt and pepper, and serve with the kebabs. Smashed potatoes have the skins on and are a little chunkier than standard mashed potatoes. 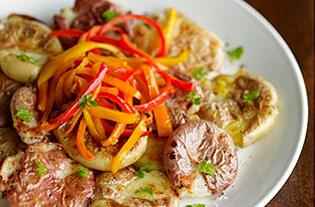 Caramelized onions will make this familiar side dish a healthy family favourite. Melt the butter in a large skillet set over medium heat. Add the onions, reduce the heat to very low, and cook, stirring often, until the onions are golden and quite soft, about 4 to 5 minutes. If the onions start to brown, reduce the heat even further. Meanwhile, place the potatoes in a large pot, fill with water to a depth of 2 inches, and bring to a simmer over high heat. Reduce the heat and cook until tender when pierced with a fork, about 25 minutes. Drain in a colander set in the sink. Transfer the potatoes to a large bowl or the bowl of a standing mixer. Scrape in the contents of the skillet; also add the broth, mustard, salt, and pepper. Beat with an electric mixer at medium speed until fairly smooth but not too creamy. Serve at once. 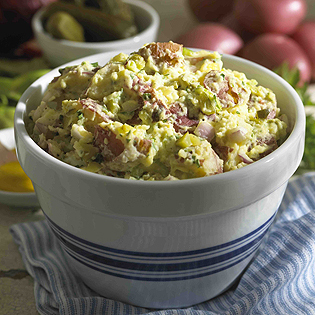 Ideal for serving along any protein that’s gracing your grill this summer, this Quick & Healthy Classic Potato Salad serves up all the rich flavor of your family’s favorite, without the expected calories. By swapping mayonnaise for non-fat plain yogurt, this recipe is 100-percent fat-free with all the crunch and wholesome flavor you’d expect. If requiring a gluten-free recipe, check the label of the indicated (*) recipe ingredients to ensure they are gluten-free. Place whole potatoes (do not poke) into microwave-safe dish. Cover dish. (If covering dish with plastic wrap, poke small hole in plastic). Microwave on high for 10 to 12 minutes depending on strength of microwave. Use oven mitts to remove dish from microwave; carefully remove cover from dish due to steam build-up and let cool. 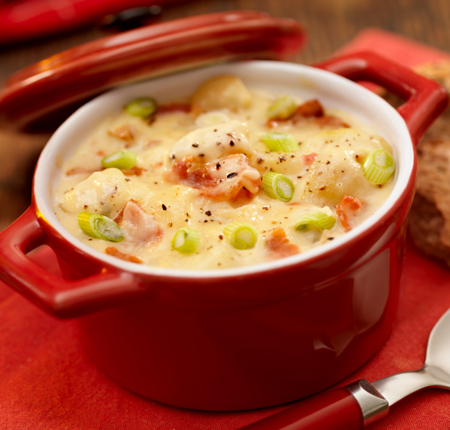 Cut potatoes into bite-size pieces and place in a large bowl with remaining ingredients; stir well to mix. This salad may be served right away, but is best if refrigerated for at least one hour to allow flavors to blend.